In 2019 the TRAINING SHIP GOLDEN BEAR is planning a trip to the Atlantic Ocean and will NOT be calling at the Hawaiian Islands. We are considering our options for a smaller event or possibly delaying another event until 2020 when the TSGB will return to Hawaii. 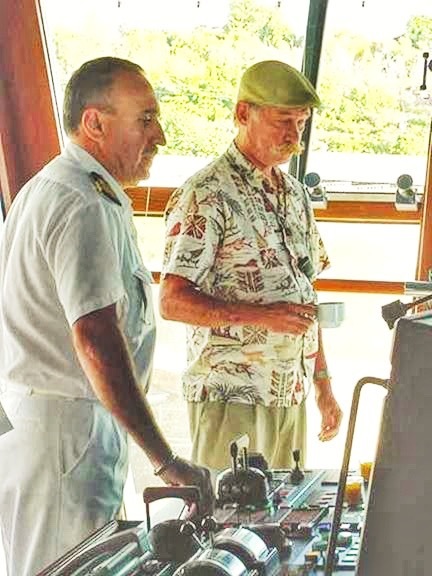 Capt Dave Lyman works with the Master of the CARNIVAL SPIRIT during there arrival into Nawiliwili in 2001. At that time she was the largest ship to ever call at Nawiliwili Harbor on Kauai. The SPIRIT was also the first azipod equipped ship to call at Kauai. COME BACK SOON AS WE WILL POST MORE DETAILS ABOUT OUR NEXT EVENT! MAHALO FOR YOUR SUPPORT! !